This entry was posted on 19 December 2015, in PERSONAL LIFE POSTS and tagged travels, vlogs. This entry was posted on 14 July 2015, in ART RELATED POSTS and tagged inspirations. Does a special word exist for the fact that sometimes, on different places in the world the same ideas pop up, at the same time? A few days ago I saw a picture on Facebook of a building made out of living trees. The branches were led and trimmed into the shape of a life-sized church. The structure was complete open and the inside of the building was usable as a sheltered area. Barry Cox, the owner of this project grew it in only 4 years! So, that must have been in 2011. He plans to use his green church for weddings and I find it a great idea! Then I discovered the guy lives in New Zealand! Just like me. I will definitely visit his garden when it opens in spring. I couldn’t help to see a kind of similarity with my painting ‘The same one’. I painted it 2 years ago and who is willing to believe me it was in my sketchbook for years? It doesn’t matter, because I love the imagination of an enormous simmering pot of inspiration, somewhere in the world. And when our globe is spinning and turning around, some splashes fling down on different people. Different people like an architect, an artist, an arborist or an entrepeneur who starting to play with them. Maybe our ideas came from the same source. Or are made out of the same ingredients. This question is the most asked and the most difficult to answer. Well no, none of them all. My ideas are the results of my development and never thrown to me for free. Getting a potential image in my mind is a different way of looking at the things around me. I think it is something anyone can learn. When I started painting in my late twenties I noticed that my way of observing things was slowly changing. For example; I realised that while I saw a colour, I dissected the color at the same time. To be more clear; if I saw a particular kind of brown, than somewhere in my brain -almost at the same time and initially unconscious- I parted them in a certain amount blue and red … a pinch of white, and maybe some magenta. Sometimes, during a milli-second, you think you see something that doesn’t match reality. Like seeing a sleeping black cat in the corner of your dusky room. But … you don’t have a cat! The second milli-second you know that it is your lost cardigan, fallen from the chair. In the period I started painting, I hung on to that first milli-second. A sleeping cat is quite common, but sometimes a shadow may look like an airplane flying into your room. Or the garbage bags can look like a baby elephant sitting on the verge. My oldest paintings were called magic realism; Things that could be possible in reality, but are quite unlikely to happen. After that first period, I started to transform everyday materials in other materials. The folds and bumps in my duvet became a landscape of hills and the print of the fabric became a pattern of weirdly planted trees. The pins of a hairbrush became trees on a hill too. The papery husk with the tiny nerves of a gooseberry became a tree in itself. And there are my first series of landscapes, with their own fictional stories. Times went by. In the meantime I learned some lessons in life. Experiences settled. And some stories stayed with me, meant to be told. I still loved painting trees. But from then on the trees were no pieces of decoration any more. They got a role. They became the leading actors in what I wanted to say. And there … you get the second series of landscapes. This time with non-fictional stories. But the stories are not only my views on life … they are the views on life of millions out there. The stories are connections between your experience and mine. Different experiences of the same core. The weird thing always has been, is that the image is there before I figure out the meaning. So, in thàt perspective you can say inspiration is coming from something I don’t have control about. But then, the stories are still coming from a source inside me. After all, most of my ideas are more realistic than they look like at first sight. 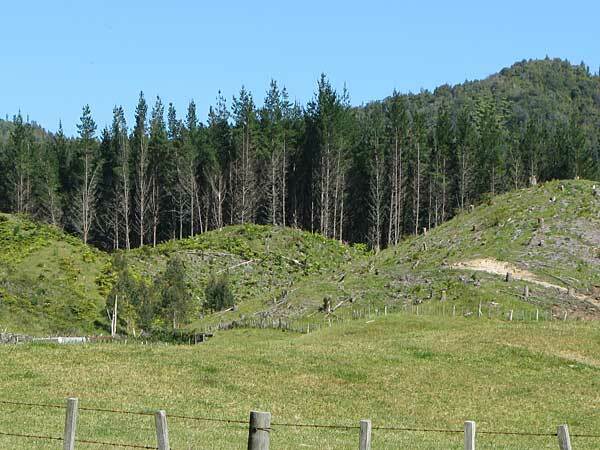 For example; On the way to Rotorua, there is a hill with trees at the left side of the road and one lonely tree at the right side. However, in reality that lonely tree is a different type, so probably driving on that road nobody sees the link like I created in a painting called ‘The brave one’. To transform the lonely tree in the same type of trees at the other side of the road, was just that image of the first milli-second. The meaning became clear days and days later, while I was already painting the second or third layer. This entry was posted on 28 May 2015, in PERSONAL LIFE POSTS and tagged travels, vlogs. This entry was posted on 26 May 2015, in PERSONAL LIFE POSTS and tagged travels, vlogs. This entry was posted on 24 May 2015, in PERSONAL LIFE POSTS and tagged travels, vlogs. This entry was posted on 22 May 2015, in PERSONAL LIFE POSTS and tagged travels, vlogs. This entry was posted on 20 May 2015, in PERSONAL LIFE POSTS and tagged travels, vlogs. Traveling from the island Liuqiu to Kaohsiung. Finding a hotel and walking at the night market. This entry was posted on 19 May 2015, in PERSONAL LIFE POSTS and tagged travels, vlogs. This entry was posted on 18 May 2015, in PERSONAL LIFE POSTS and tagged travels, vlogs. This entry was posted on 17 May 2015, in PERSONAL LIFE POSTS and tagged travels, vlogs. A long bus trip, a fancy hotel room, trees with a website and a boardwalk. This entry was posted on 16 May 2015, in PERSONAL LIFE POSTS and tagged travels, vlogs. Traveling from Taipei to Taichung by high speed rail. This entry was posted on 14 May 2015, in PERSONAL LIFE POSTS and tagged travels, vlogs. This entry was posted on 13 May 2015, in PERSONAL LIFE POSTS and tagged travels, vlogs. This entry was posted on 12 May 2015, in ART RELATED POSTS and tagged ponderings, vlogs.